Oops, it’s been a few months since my last post. So, what are my excuses this time? The usual—holidays, sickness, family stuff, doggie drama, and work. I had a respiratory infection that lasted over seven weeks. During that time, I didn’t cook very much and when I did, it wasn’t inspired. Some of the results were downright dismal. Definitely not blog worthy. Unless, I wanted to write about my failures, which could be funny. I was beginning to think there was a curse in my kitchen. Maybe it was just my taste buds weren’t working. Thankfully, my taste buds are returning to normal and I’m cooking more. This weekend, I made something that was so simple; it was not even recipe worthy. However, it was divine. It all started in our backyard. We were clearing out the winter garden to make room for the early spring garden. I’m not sure if we are supposed to do this now, but the timing seemed right to get the onions in the ground. We’re learning what works for us. In the process of clearing space, we had to sacrifice some carrots. We harvested the prettiest, most tender baby carrots I’ve ever seen. They were an organic rainbow mix – orange, yellow, white, and, purple. Beautiful and delicious. I trimmed the stems and put them in the compost. Washed the carrots. In a skillet over medium heat, I steamed/sautéed the largest ones first in just a bit of water. Then added the next ones in size. I added the tiniest carrots at the end of cooking; they only had a few seconds on the heat. By this time, the water was gone, so I added a smidge of butter. I then topped them with freshly snipped parsley and a sprinkle of Kosher salt. Within 30 minutes, the carrots went from in the ground to on our table. To me, food doesn’t get much fresher or better. 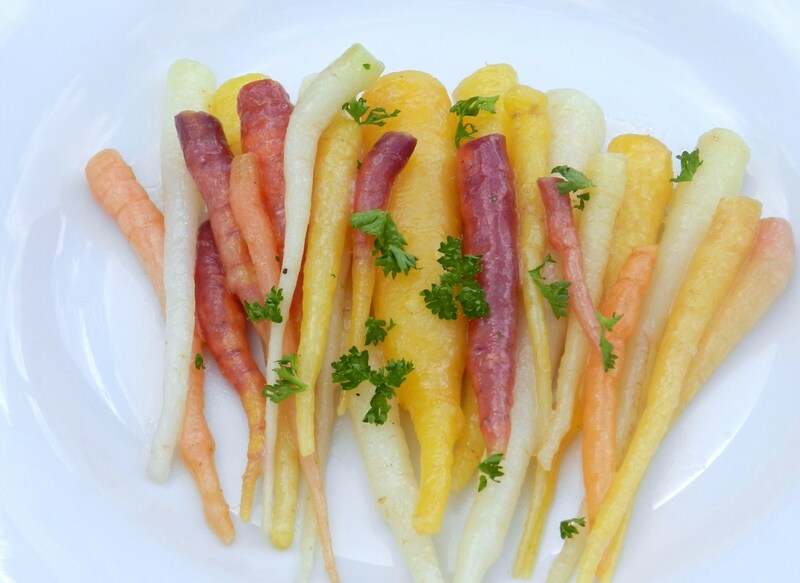 It sounds silly, but they were so “carroty” tasting that it’s almost indescribable. If your only experience with baby carrots is with those little nubby things in the grocery store, then you are missing a treat. I would highly recommend buying some at a local farmers market or even better yet, growing your own. Carrots are easy to grow. You can even grow them in a deep pot if space is a problem. Happy eating and happy gardening!